Are you looking for a reputable service facility for a quick Oil Change in Weston? Automotive maintenance doesn’t have to be mysterious or daunting. When you get right down to it, it’s really pretty simple, actually. It all starts with a few basic building blocks. Perhaps the most important basic service of all is your average oil change. Oil changes give your car, truck or van a much needed boost and help protect the engine from the ravages of heat and friction. Oil does a simple but very important job within your engine. It protects against heat, but it also ensures that moving parts don’t come into contact with each other. However, oil does wear out over time. As it does, it loses its viscosity (a measure of its ability to lubricate). Eventually, it breaks down. That’s why it’s important to have your oil changed regularly. An oil change should be more than just a quick drain and fill. It should also include an oil filter change (the oil filter is responsible for trapping dirt and debris that would otherwise circulate with the oil through the engine). A professional oil change should also include an inspection of your vehicle for trouble signs (transmission fluid, tire pressure, air filter condition, etc.). Changing your oil regularly is vital. On average, most consumers should have their vehicle’s oil changed every 3,000 miles, or 3 months, whichever comes first. However, that frequency varies depending on the type of oil you’re using. There are several full synthetic formulations that are capable of providing protection for longer than 3,000 miles. Make sure you’re using the correct oil for your vehicle. The OEM recommended oil weight should be visible on the oil filler cap, or in your owner’s manual. The weight is a measure of how well that particular oil flows at specific temperatures. Your car might be rated for 5W20, or 5W30 (or perhaps something thicker – 10W30, for example). Change your oil regularly, and ensure that your service is being performed by a reputable company in Weston, FL. 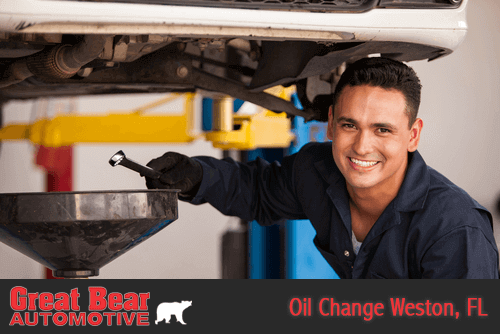 For all your Oil Change Weston, FL, Visit Great Bear Auto Repair today.